Friends of the Division of Student Affairs can give to a variety of funds and scholarships, which are used to support students in their pursuit of higher education at Indiana State. 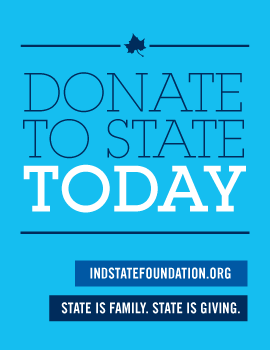 These funds and scholarships serve a wide variety of students and student needs and foster wellness, stability and success in Indiana State’s student body. The Fund is named for former ISU Ombudsperson Michael Phillips and is an invaluable resource for all Indiana State students and families. The Fund was created to provide monetary assistance to students who have an emergency need for funding. This support can make all the difference in a student's security and academic survival. The Miss Indiana State University Scholarship Program is a preliminary for the Miss Indiana Scholarship Program and the Miss America Scholarship Program. Miss Indiana State University has been in existence since 1958. There have been 34 women who have served as Miss ISU. The program has been offered continuously since 2002. Scholarships are the foundation of this program along with Service, Style, and Success. The Edgerton & Elsey Undergraduate Scholarship in Student Affairs was developed to honor the contributions of Mr. Paul Edgerton and Dr. Robert Elsey, two long-standing Indiana State University administrators in the Division of Student Affairs. The scholarship will allow undergraduate students to work within the Division of Student Affairs for a year and explore the field of Student Affairs. Funds raised for the program will benefit educational opportunities for each recipient, including but not limited to membership within professional organizations, travel to state, regional, or national conferences, and a monthly stipend. Please click the link above for a complete list of funds available for contribution. If you have any questions about giving, please feel free to contact the Office of the Vice President at 812-237-3888 or the ISU Foundation at 812-237-6100. If you would like to give to the Division of Student Affairs, any of the Division’s 14 units or its four student resources centers, including La Casita, International, LGBTQ or Women’s Student Resource Center, please click this button and deginate your desired fund when prompted.